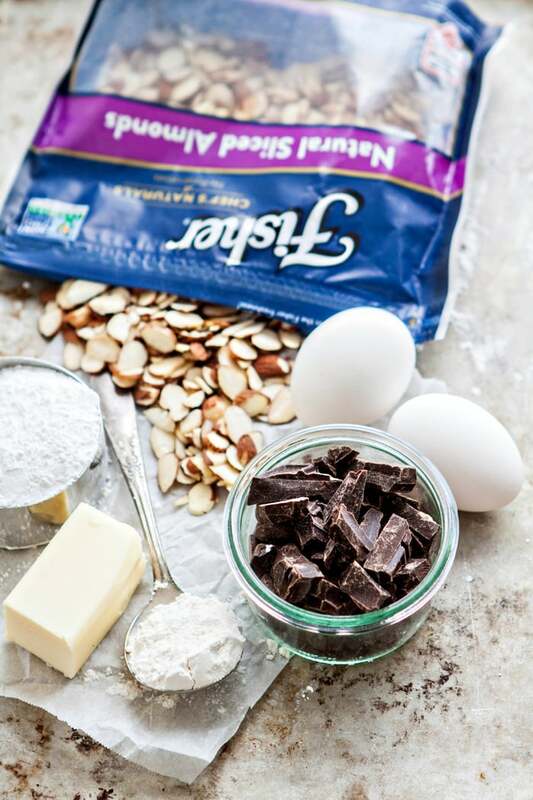 This recipe for Dark Chocolate Almond Molten Lava Cake Sundaes was made in partnership with Fisher Nuts. As a single mom the previous few years, I had absolutely zero motivation to celebrate Valentine’s Day. Unless it involved making some sort of cutesy sweet treat for my kiddos. We focused on recipes like Easy Vanilla Cut-Out Cookies or Easy Pink Velvet Pancakes, and giving my kids some cute Valentine’s Day gifts like a card and stickers. In fact, previously the holiday had kind of been a pretty sensitive time for me, not just because I was single mom, but because of the timing of when my first marriage imploded. February hasn’t been a month I cared for in what feels like a long, long time. To say that I’m just a tad bit excited to have all of that behind me is a bit of an understatement. Kevin and I weren’t a couple last year on Valentine’s Day. We kind of had an untraditional courtship (that sounds a little old-fashioned…) and began dating, then got engaged, then married all within the span of about 5 months since we had already known each other for almost 2 years by the time we started dating. 2016 was a bit of a whirlwind year for us, in all good ways. So, this is both our first year together as a couple for Valentine’s Day and our first Valentine’s Day since getting married. February is a bit of a crazy month for us with some travel for Kevin and lots of things on the calendar. I actually have no idea if we’ll get to go out for Valentine’s Day or not and we haven’t even talked about it yet. But, I’m definitely happy that I have such happiness and love in my life now. 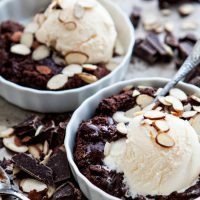 If February is a busy month for you, too, and you can squeeze in some time to make a special treat at home even if you don’t have time for a romantic evening out, you will definitely want to give this recipe for Dark Chocolate Almond Molten Lava Cake Sundaes a try. Or maybe, like my past self, you’re single and hurting over being single. 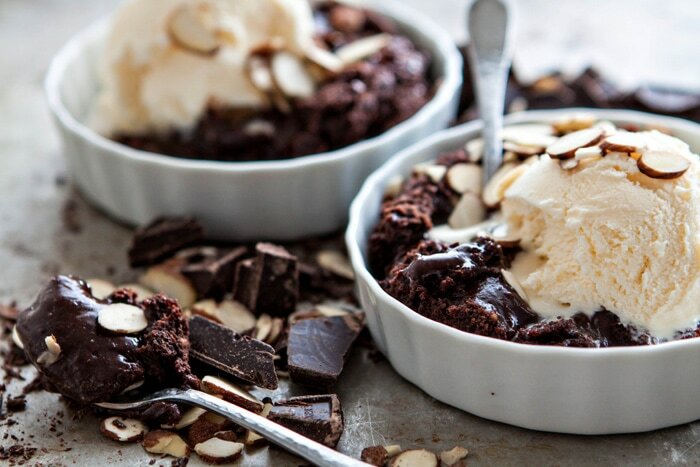 Make these Dark Chocolate Almond Molten Lava Cake Sundaes and give yourself a night to do something you enjoy, like watching a movie while eating this decadent Valentine dessert or having some other single friends over for an evening together. They’re pretty quick to prep. Quick enough that the photography took me longer than the actual assembly and baking. 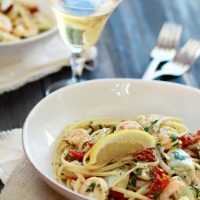 Quick enough that you can whip them up after you get the kids in bed or while you’re friends are on their way over. Dark Chocolate Almond Molten Lava Cake Sundaes are my new favorite dessert. The Lava Cake part features Fisher Nuts preservative-free non-GMO almonds all ground up into a fine powder. Plus, you have chocolate, amaretto, almond or vanilla extract, butter, flour, egg, and sugar. Did I mention plenty of chocolate? A Valentine dessert requirement is chocolate. The outsides of the cake are like a rich cake with a little bit of a crunchy chewy edge, and the inside is oozing with chocolate lava that tastes like hot fudge sauce. The cakes are inverted on a plate, broken purposely to let the lava fudge ooze out, and topped with a big scoop of vanilla ice cream and more Fisher Nuts Almonds for an extra crunch (plus, almonds and chocolate pair really well together). If you want to get really, really decadent, you can top the whole Dark Chocolate Almond Molten Lava Cake Sundaes off with extra hot fudge sauce, some homemade whipped cream, and shaved chocolate. But I think they’re plenty rich on their own…and, like I said, the lava part tastes just like hot fudge. They’re sort of an outside in hot fudge (rather than the hot fudge being outside as a topping). I much prefer this way of making Molten Lava Cakes. You purposely break them when inverting them instead of having to fuss with trying to get the cake to come out of the ramekin looking all perfect and in one piece. Because for me, never ever have I successfully done that to perfection. 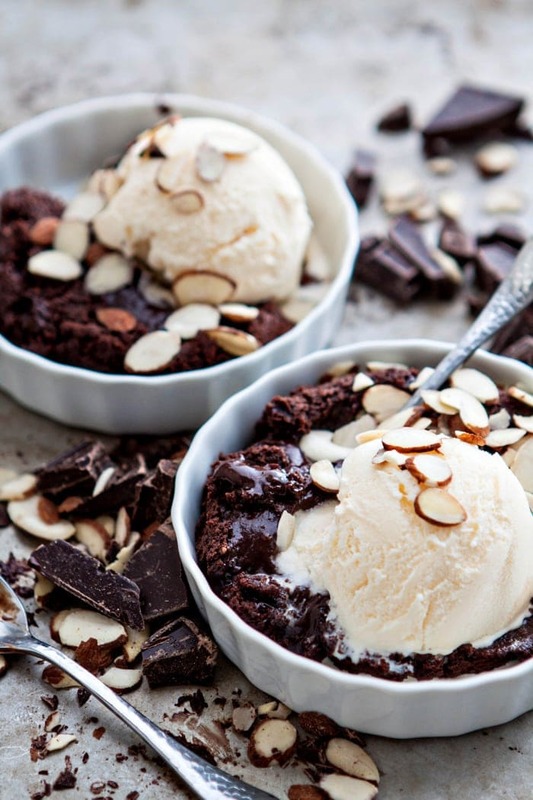 It doesn’t matter if they look deformed, because you’re going to cover the Dark Chocolate Almond Molten Lava Cake Sundaes in ice cream and almonds anyway. 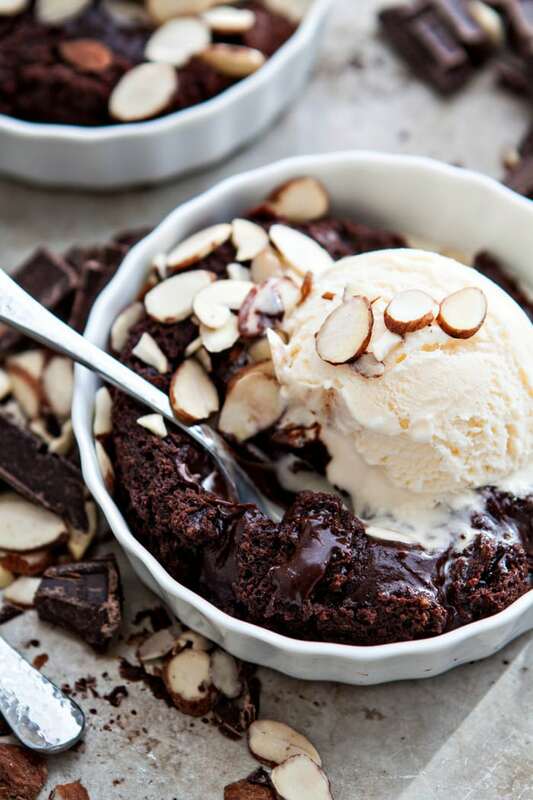 Plus, warm chocolate lava oozing all over the plated mixed with melted vanilla ice cream and crunchy almonds is pretty much the best thing ever to eat. Whatever you end up doing for Valentine’s Day, you definitely deserve a gooey chocolatey almond Valentine dessert in your world! For rich layers of white chocolate and dark chocolate pudding paired with raspberries, try these Triple Chocolate Raspberry Pudding Parfaits. Cherry Vanilla Cupcakes for Valentine’s Day are perfect if you’re looking for something cute, sweet, and pink for the kids. You can use chocolate ganache for lots of different things. 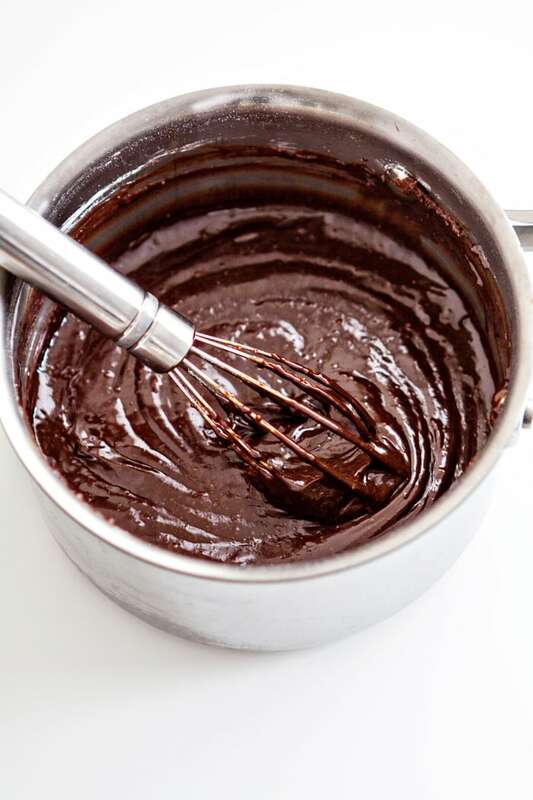 Learn How to Make Ganache and 5 Ways to Use It. Hint: one of the things it is good for is dipping Fisher Nuts and fresh berries. Chocolate and Raspberry are classic pairings in these Chocolate Cupcakes with Raspberry Buttercream. Grease the bottoms and sides of two 6 ounce oven safe ramekins or custard cups. Set aside. In a small bowl, beat the whole egg, egg yolk, amaretto (if using) and almond extract or vanilla extract with a wire whisk until well mixed. Set aside. In a another small bowl, combine the finely ground almonds, flour, and powdered sugar. Add the bittersweet chocolate and the salted butter to a small saucepan. Cook over low heat, stirring frequently, until melted. Remove from heat. Add the sugar mixture to the melted chocolate and butter and stir until it is well mixed. Then, add the beaten egg mixture and stir until the mixture is fully incorporated and smooth. Divide the mixture between the two prepared ramekins. Bake at 425 degrees F for 10-12 minutes. The edges should be firm and the centers still soft. After baking, making sure to use a towel or oven mitts to protect your hands, remove from the oven. Then, run a knife around to loosen the cake from the ramekin. Then, making sure to continue protecting your hands as the ramekins will be hot, invert each cake onto a small plate or a low, flat bowl. Cut into the lava cake in half (or even quarters) and open slightly to allow the lava to ooze out. 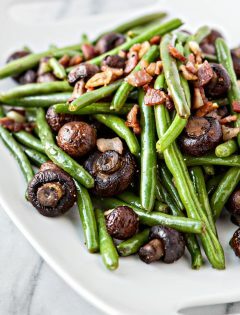 Top each with 1/3 of a cup of vanilla ice cream and sprinkle with almonds. To grind the almonds, place sliced almonds in a small food processor and chop until a very fine powder is formed. 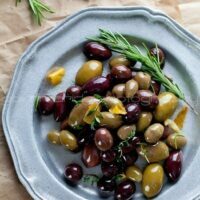 Depending on the size of your food processor, you'll need to process more than you actually need (I recommend starting with 1/4 cup sliced almonds). 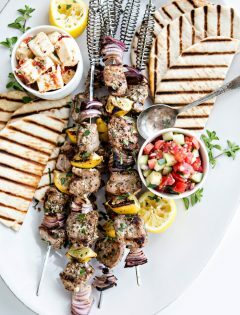 Then, measure what you need for this recipe and save the rest for another occasion. 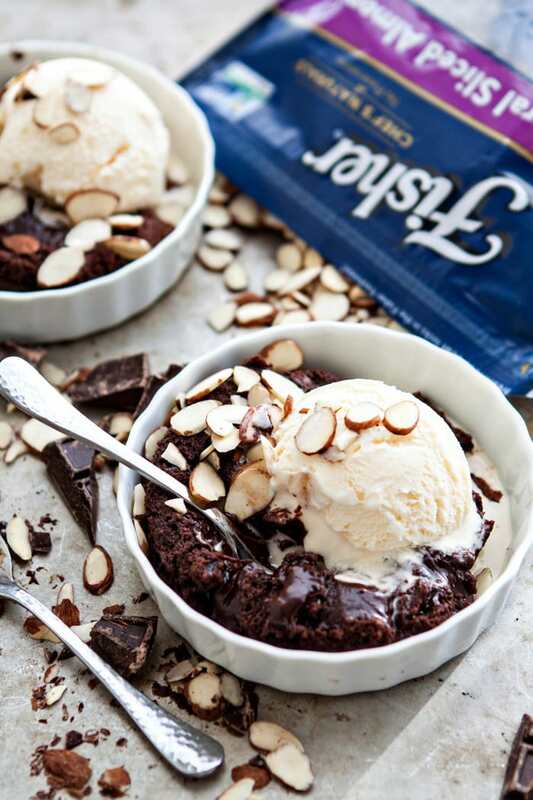 This recipe for Dark Chocolate Almond Molten Lava Cake Sundaes is a sponsored conversation written by me on behalf of Fisher nuts. I choose to partner with Fisher because I love that their produce is preservative-free and non-GMO. 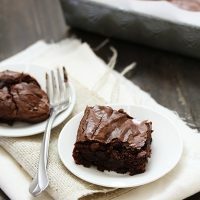 What a wonderful chocolate dessert, perfect for Valentine’s Day! Your courtship/engagement story made me smile. People thought we were a little nuts (yet not) when we were engaged after 2 months and married within 6 months. Sometimes right is right. (17+ years now.) Wishing you a fantastic first Valentine’s Day together. Thanks, Brenda! And so true…right is right. When you know, you definitely know. 🙂 Happy Valentine’s Day and congrats on 17+ years! These lava cake sundaes look incredible. I'm not a big Valentine's Day person for some reason, but I like to treat my kids and husband with a nice dinner every year. Dinner might be kind of simple this year because of our schedule but I love that you said these were so quick to put together. My family would flip if I made them this 🙂 Dessert is their love language, lol. Thank you, Aggie! I’m so happy that we got here. Seems like not that long ago all you ladies were asking me on the Bush’s trip about my dating life and I said “we’re just friends!” How things have changed! Oh, my goodness! That gooey fudge center is calling my name right now. Love the extra ice cream and nut topping to contrast the creamy fudge! Thanks, Jocelyn! Gooey + chocolate is my favorite! 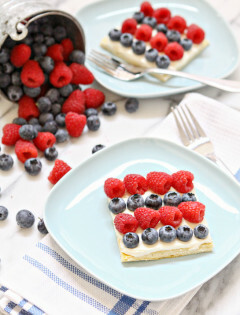 So rich and decadent – definitely a must make! These cakes are totally worthy of celebrating such a special time in your life! Although I’d be happy to enjoy them any day! I just ran across your blog when searching for a dinner recipe and I’ve already pinned several recipes and looking forward to visiting again 🙂 (Also, your courtship story made me smile. I’m so happy for you! My husband and I met almost exactly a year ago and after a (VERY intentional) long distance courtship are now happily married. What a whirlwind of a year! 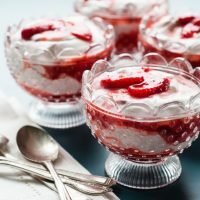 Anyhow, I’ve started seriously thinking about Valentine’s Day (for like the first time ever) and this recipe looks splendiferous so I’m planning to give it a try… Thank you!! Thanks for your sweet words Heidi and for stopping by (hope to see you again soon)! Congrats on your recent marriage 🙂 Happy Valentine’s Day! These are absolutely gorgeous. They would be perfect for Valentine’s Day or date night. Your lava cakes look so delicious, I love how you incorporated grounds almonds into this recipe. I’ll have to try making lava cakes with almonds soon! 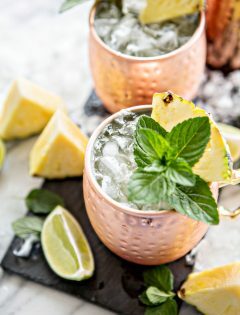 These sound yummy and very easy to make . Another thing that’s great is that all the ingredients are store cupboard type things that a person usually would have. So perfect. May you have many more lovely years together in your marriage . So my son (almost 6) has been wanting to open a donut shop since he was 4. It’s the cutest ever. Anyways, we’ve been scrolling through all your recipe’s and he’s completely blown away and has demanded we make this NOW.